Talking fast-food cover bands with Mac Sabbath's man-in-charge. Fast-food cover bands are everywhere, playing other bands' music, generally copping their whole act and calling it a tribute. Doesn't that piss you off? I mean, when you're laying down a portion of the pittance you earn for doing oil changes in a jiffy, or passing out burritos to fat, braying customers, don't you want more than musical pink slime? The franchising of rock 'n' roll is imminent. In the early 2000's Austin, Texas, experimental band Brown Whornet once said they intended to sell BW franchising rights. Gene Simmons of Kiss—part-marketing genius, 100 percent douchebag—wants to replace all Kiss members via a reality show. Even cover bands are doin' it: Nerdy '80s cover band The Spazmatics, who play Liquid Joe's every weekend, exist around the country in multiple iterations. Living in McMurrica, it's an inevitability. There's product placement in songs and videos. Vegetarian Violent Femmes singer-songwriter Gordon Gano let Wendy's use "Blister in the Sun." Corporations already control music. Now Los Angeles-based Mac Sabbath is juxtaposing the dulcet tritones of heavy metal giants Black Sabbath with iconic characters that once repped a gargantuan grease purveyor—and even changing the lyrics. "I am Iron Man" is now "I have frying pan." The (totally spiritual) weed jam "Sweet Leaf" is now "Sweet Beef." We don't have to take this. City Weekly demanded to talk to the manager—who, it happens, is the only one allowed to do Mac Sabbath interviews. Image is everything, and MacSab employees are required to cultivate an air of mystique—not unlike that of space-hessians GWAR. Hello, "Mike." Welcome to City Weekly. Would you like to try our snarky editorial today? Order when you're ready. He laughs at this attempt to give him a taste of Mac Sabbath's ostensible parent company's pointless, canned drive-thru greetings. And, before taking questions, he belches some fine-print-speak about not using the "M-word" or even terms describing the consequences of using said term. "Mc," however, is somehow acceptable. Likewise, any mention of Black Sabbath. Mike says there are all kinds of gray areas we need to avoid. "Like the meat?" I ask. Once more, he laughs. Anyway, dude. Order when you're ready. "No," Mike says. "What can I do for you?" This customer-service judo is a real pain. And here comes the mission statement, which he weirdly attributes to his subordinate. Oh, come on. "Ronald [Osbourne, singer] maintains that he's traveled here through this time-space continuum from the '70s, when music and food was still real," Mike says. "He's here to deliver this message that we've got to get back to the values of the food and music of that time." It's not the first time a corporation used traditional values as marketing B.S.—but it might be sincere. The lyrics in "Frying Pan" mention grease and pink slime, like Mac Sabbath's parent company makes stuff that's actually bad for you. Could it be that Osbourne, guitarist Slayer MacCheeze, bassist Grimalice and drummer Catburglar are a "message band?" Perhaps we've misjudged them. Also, the music is spot-on. Ronald sounds like Ozzy. Slayer riffs like Iommi. As for Grimalice, Mike says they often hear, and say themselves, "I can't believe it's not [Geezer] Butler." The Catburglar seems to be doing his best Bill Ward, but with the Peter Criss makeup and the Ham—er, Sandwichrobber's, caped black-and-white getup ... Is that Eric Singer ... the guy currently portraying Criss in ... Kiss? 'Cause that dude was in Sabbath, too, and tends to take a lot of those scab gigs, subbing for original members of popular bands. More laughter. Mike's not taking this seriously. There's nothing worse than when someone in a position of authority makes a mockery of your legitimate complaints. This is clearly going nowhere. Click. Epilogue: If you can't beat 'em, join 'em. Mac Sabbath's many YouTube clips make the ears and eyes—if not the mouth—water. ("Frying Pan," Mike pointed out, just achieved the "one million served" milestone.) 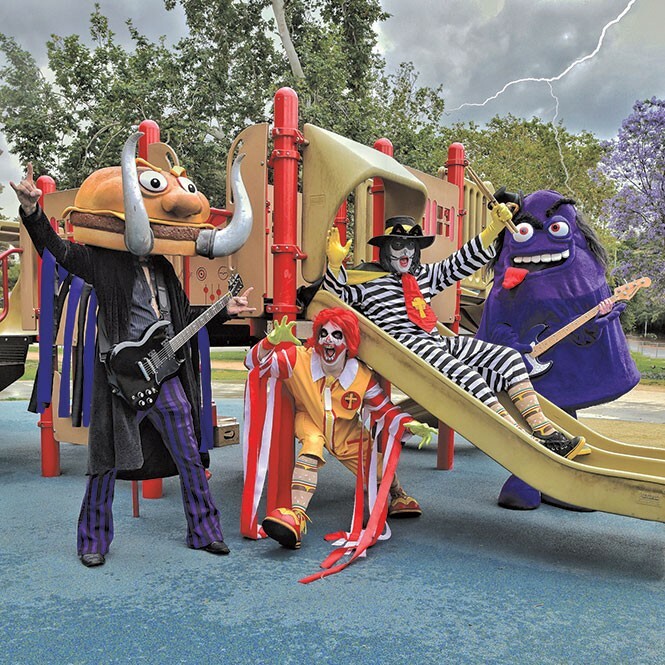 Just as they drank the Kool-Aid at Jonestown, perhaps it's time to partake of Mac Sabbath's sweet gray beef.